HAI OmniTouch with Video has all of the features of our award-winning OmniTouch, plus the ability to see digital video of up to 6 cameras. 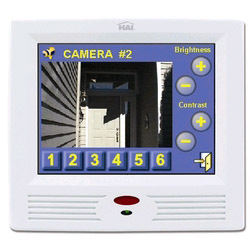 It is ideal for seeing who is at the front door, pool, garage or nursery. You simply touch the Video icon and select one of the 6 cameras for display. 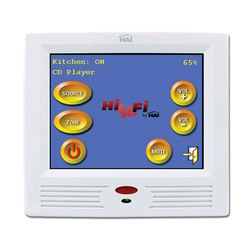 The screen will show the video image in a window with the 6 camera selection buttons. Tapping the image brings it to full screen, tapping it again brings it back to the video window. There are brightness and contrast controls for each of the 6 cameras. 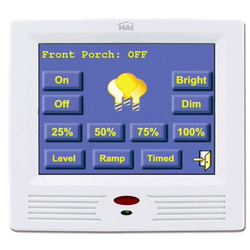 For example, it can automatically display the front door camera when the doorbell rings, and the pool camera if motion is detected in the pool area. Also, pressing and holding the camera selection button next to the video image can release a door strike to let your visitor in! 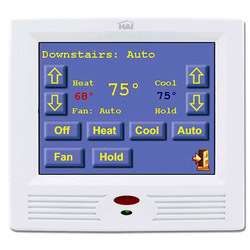 The video capabilities complement HAI's complete home control systems. OmniTouch with Video can control lights, security, macros, temperatures, multi-room audio (HiFi from HAI, NuVo, Russound, Speakercraft or Xantech systems), video cameras via easy-to-recognize icons, making it extremely versatile and unmatched for high performance at its low price. 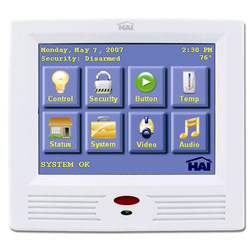 OmniTouch with Video require a HAI's Touchscreen Hub and Power Supply and HAI Video Encoder. Power, data and video is provided over a single Category 5 connection. Video frame rate is approx. 4 frames per second.